Before you start reading Intex Explorer K2 Kayak expert insights . In today’s humdrum of daily life, spending quality time with your significant other family is a rare occurrence and quite often, a harried experience. Syncing schedules, planning flights, hotels are not only stressful they are also time-consuming. However, a concept that is fast catching up is that of shorter and more frequent breaks – these obviously mean lesser planning, lower stress and equal if not more quality time with your loved ones. One such option that is guaranteed to bring a lot of cheer and fun into your life is kayaking. Those who have tried this activity before can vouch for the excitement, relaxation, fun and bonding experience that it provides. As with any outdoor activity, it is important to invest in quality gear that is safe, comfortable and durable. 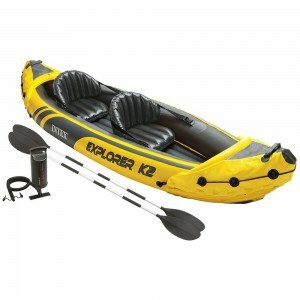 If this is something that you would like to explore with your loved ones, check out the Intex Explorer K2 Kayak! 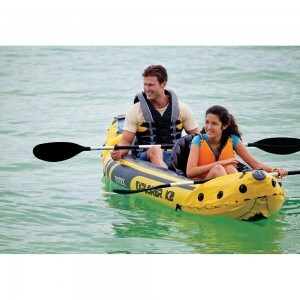 Designed for experiencing lakes and mild rivers, the Explorer K2 is sporty, fun and perfect for two individuals. Its lightweight and compact construction makes this gear easily transportable. This is a great advantage, especially if one loves impromptu getaways! 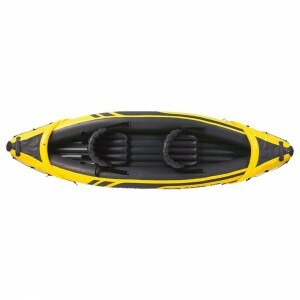 Like in other Intex gear, the bright yellow colour and bold graphics make the kayak visible in the water. Here’s what you should look for in used kayaks. Try our used kayak reviews. It is important to make a balanced judgment when you purchase a kayak since there are key factors of safety and comfort that are involved. Here are some pros and cons of the Explorer K2 that you should weigh before you make that purchase! Looking for a fishing kayak? Try Sun Dolphin Excursion 10 fishing kayak. 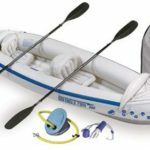 Excellent Starter Kit: If you or your loved ones have just been introduced to the joy of kayaking, then the K2 Kayak is for you! It comes with everything that you need regarding safety and comfort. Its ease of use and control par excellence makes this an ideal choice for kids as well! Bright Color: This ‘as bright as sunshine’ kayak makes it difficult to miss it on the waters. The bright colours will help if there is an unforeseeable distress situation. US Coast Guard approved: It is US Coast Guard approved- this endorsement should put to rest any apprehensions you may have about the product. Spacious: In addition to comfortable seating for two, the Intex Explorer K2 inflatable Kayak also provides ample space in the rear for additional storage such as food, water or any other equipment. It is a refreshing change from other inflatable kayaks that focus solely on seating and do not offer any additional storage. An important factor to note here is that the space advantage means you could also use this kayak for fishing. Comfortable seating: You must agree that relaxation will be impossible if the seating is uncomfortable. Not with the Intex K2. Not only is the room comfortable, but the backrests are also adjustable and provide extra support where it is needed most. Lightweight: Being inflatable, the K2 kayak is remarkably lightweight and can be carried by one person. It means, that if one wants to spend quality time with himself/herself – no problem! A steal for the cost! : For families looking for a real bargain, young couples on a tight budget, college students or adults who are new to kayaking, the Intex K2 should figure high on the shortlist. It is an absolute bargain for the value it provides. There isn’t a better kayak in the market. Non-adjustable paddles: Despite being a two-seater, it is surprising that the Intex K2 does not come with adjustable paddle lengths. This could mean that it will be an inconvenience for shorter people or children to manoeuvre the kayak. Minor design flaw: The bottom of the kayak is black making it absorb more heat. 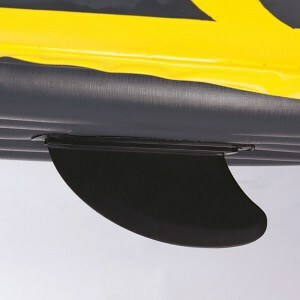 This could cause the kayak to inflate over and eventually cause tears or punctures. The Kayak does, however, come with a repair kit. In conclusion, the Intex Explorer K2 Kayak delivers on its promise of providing an easy and fun kayaking experience to all its users. It is a definite ‘must buy’ if you are looking at high value and optimum cost.